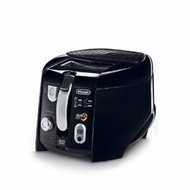 Enjoy crispier and tastier food with the De’Longhi Roto Deep Fryer with 1.5 lb food capacity. You can save on oil consumption by using half the oil of traditional fryers with the Roto Fryer’s tilted rotating basket, which also achieves crispier results every time. If messy, hot oil cleanup scares you away from using deep fryers, the patented easy clean oil draining system will help combat your fear. Simply pull out the hose stored in the front of the fryer and drain the oil into the included oil-collecting container The non-stick interior and dual filtration with included replacement filters also help with the easy cleanup and lingering odor protection. If your kids like to help with the cooking, you can feel safe using the fryer with them around because of the cool touch exterior walls, the detachable cord, which features a magnetic cord that easily detaches from the fryer if accidentally pulled and the patented condensation shield, which prevents oil from dripping onto the cord connection. You can check the frying progress without having to dodge splattering oil with windowed lid and outer cool touch handle. It raises and lowers the basket while the fryer lid is closed. Other highlights includes adjustable thermostat and digital timer.